Karachi: Plastic was considered though as a blessing at the time of its invention which has now turned out to be disaster to the planet. Due to its light weight, low-rates and various uses almost every sector and industry has become dependent on plastic products. What we need is the simple innovative solutions to address this growing global issue. This was stated by speakers during a Green Innovation Challenge (GIC) event organized by WWF-Pakistan at a local hotel in Karachi. GIC was a competition that aimed to empower the next generation of social entrepreneurs by providing a platform to transform their ideas into ventures with a strong potential to reduce or eliminate plastic waste in Pakistan. 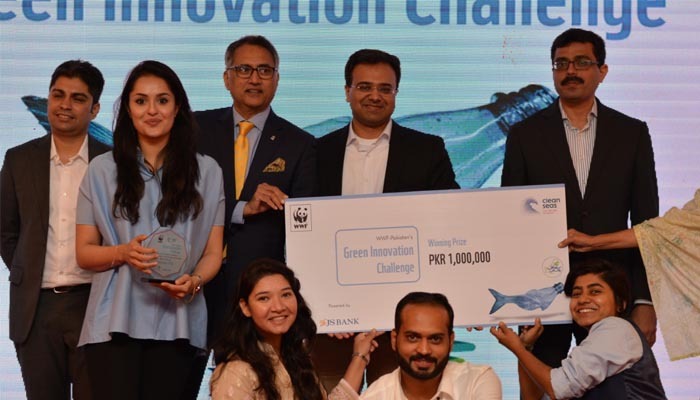 WWF-Pakistan initiated a national competition of GIC in collaboration with UN Environment Programme’s Clean Seas campaign, powered by JS Bank and NIC Karachi. The campaign was a three-staged start-up competition aimed at supporting technology oriented solutions that provide innovative solutions for mitigation of plastic pollution. The campaign was also initiated with a joint effort of Reckitt Benckiser, Artistic Fabric and Garments Industries, Adamjee Group, The Nest i/o Pasha, NIC Lahore, travel partner Careem and media partners MangoBaaz and FM 91. Almost 100 competent teams from all over Pakistan participated in the competition, out of which 10 teams qualified for the final round. The grand finale of the competition took place in Karachi, where teams pitched their ideas live to a panel of judges under an 8-minutes timeframe, followed by a 7-minute question answer session. The winning team was awarded a seed funding of PKR 1.0 Million. Speaking on the occasion, Hammad Naqi Khan, Director General, WWF-Pakistan shared that many of sea creatures – birds, turtles, whales die because of the plastic suffocating our seas. He said that many marine animals particularly turtles and whales are found to possess plastics in their bodies. He deplored that around 800 million tons of plastics are dumped every year in oceans which are not only harming ecosystems, aquatic life but adversely impact human health. He shared that Only 10 rivers around the world are responsible for 85% of plastic pollution of the oceans, of which 8 rivers are located in Asia including Indus River. He emphasized that as individuals we can help by making lifestyle changes, like recycling more or avoid using single-use plastics. ‘You might think your contribution is small, but together our collective action is powerful’, he added. Followed by a video message by Eirk Sandnes Lindebjerg, Global Plastics Policy Manager at WWF International who thanked the partners for joining hands to combat marine plastics, teams presented their ideas to the jury consisting of experts from different fields. Presenting an idea to prevent plastic pollution, Mudasser Iqbal, an Aerospace Engineer from the UK said that the majority of plastic that ends up in the seas and oceans is through the freshwater rivers, and the River Indus is the second most polluted river in the world. He proposed that to mitigate plastic pollution transported by the River Indus to the Arabian Sea, floating barriers in critical areas at river should be set-up that can help trap plastic items. He also shared that it is a simple cost-effective solution that can help boost circular economy where the plastic collected from barriers will be reintroduced. ‘Through this solution, plastic pollution can be reduced 50 per cent by 2030’, he added. While, Ayesha Chundrigar, Founder and CEO of Ayesha Chundrigar Foundation (ACF) shared that the harnesses currently in the market are of poor quality that cause severe injuries and deaths of donkeys - the only source of livelihood for daily wagers such as donkey owners. This also leads to debts on the donkey owners as the available harnesses are very expensive. In order to eliminate the plastics from the environment and facilitate the community at the same time, Pakistan’s first humane donkey harnesses will be made from non-recyclable materials such as ghost-nets, plastic sacks, polythene bags, straws, jute sacks and straws. The ideas put forth by the participants ranged from innovations in materials and manufacturing processes to alternatives to single-use plastics. Some interesting porotypes were also demonstrated by the finalists. One team by the name of Bees Knees proposed a solution of replacing single use plastic food foils with cotton wraps covered in bee wax, which can last up to 8 months. Innovators proposed solutions on how ghost nets from the sea can be turned into attractive jewellery and clothes. All ideas revolved around reducing plastics by involving communities in Pakistan - a unique way of engaging them and lifting them out of poverty. The winner of GIC award was ACF as the idea appealed most to the judges and participants. This pilot project will only reduce plastics but promote animal welfare in Pakistan. Hammad Naqi Khan, Director General-WWF Pakistan; Nargis Latif, Owner-Gul Bahao, Sara Taher Khan, CEO- FM91; Ather Imran, CEO-Sybrid; Yawar Herekar, Head of Sustainable Finance- JS Bank; Najeeb Nayyer, Advisor-NIC Karachi; and Humayun Farooq, Marketing Director- JS Bank were a part of the judging panel.